Apart from the Ambassadors mechanism that we decided early on to use in the expansion, it was pretty evident that new locations should be made as well. We already had some ideas that weren't used in the main game and new ones would keep on coming as we worked on the ambassadors. However, early on we realised a problem that was lurking. The way the main game was structured, new locations made sense only as Special Locations (that was for example what all the promos were up to that point). They would be shuffled with the old ones and they would be randomly drawn during games. However, the more special locations we would make, the harder it would be for them to appear in a game. The players would have a huge pool of cards with only a few of them showing up in every game. That was not fun. The players would want to play with new cards and try out new combinations and strategies. That's when we thought of creating more Basic locations for the game. The approach would be similar to what deckbuilding games usually do: Have a big pool of cards and randomly use a subset of them in every game. Since we would also be creating new Special locations we knew we had to do something in order for them to appear more often in games. In the end we went with 15 Basic locations and 9 (instead of 6) Special locations per player. The main focus of the design was to produce a basic set that felt completely different from the original main set. This way, the first time you would rip the shrink wrap of the expansion and would sit down to play, you would have the feeling of playing a totally new game - just by using the new basic set! With these guidelines in mind and by allowing a slight rise in the complexity (as usually happens in an expansion) we created a new basic set with 3 location cards of each type. Those locations ended up being the hardest part of the development process! Cards would go back and forth at being Basic or Special, others would get rejected for being too complex or not interesting enough, some of them would be set aside for the future and so on. Even at the last moment, after months of play testing, the stats of some cards were still getting fine tuned to provide a better playing experience. Experimental Weapon. Experimental weapon is the only card in the game that has a 3 energy cube in its main cost. This card proved to be the nightmare of one of the playtest groups. Some people loved the idea of a big Energy cost while others hated it. In the end, we added the rule about spending credits when not building it which immediately made the card much more interesting. Foreign Affairs Office. A catch up mechanism in an expansion that is important to be first in the score track. Being first offers you the privilege to choose first in case two or more players want to perform the invite ambassador at the same time. However, a delayed abilities only strategy with 3 Foreign Affairs Offices in your station proved to be a bit more powerful than we wanted, hence the Limit 1. After all, how many Foreign Affairs Offices will you need in a space station? Escape Pods. A card that actually breaks the rules of the game. This is the only card in the game that you cannot discard to perform an action. However, this limited the cost of the card, making it free to play, in case a player had this card in his hand as the last card and no credits. The ability on the card is actually easier to achieve than it first appears but still, the players building a copy of Escape pods must be careful in order to achieve the 23 locations benchmark. Once you play with the expansion a few times, you will see that it is easy to reach 23 locations, when you do not need to. Once you get a pods or two down, the other players start to pass you all the expensive cards, and then your task gets harder. Many games were decided to the pods deployed successfully or not. Race Track. This card has the most bizarre way of finding a name for it. The card was actually easy to design and the play testers received it very well from the first moment. 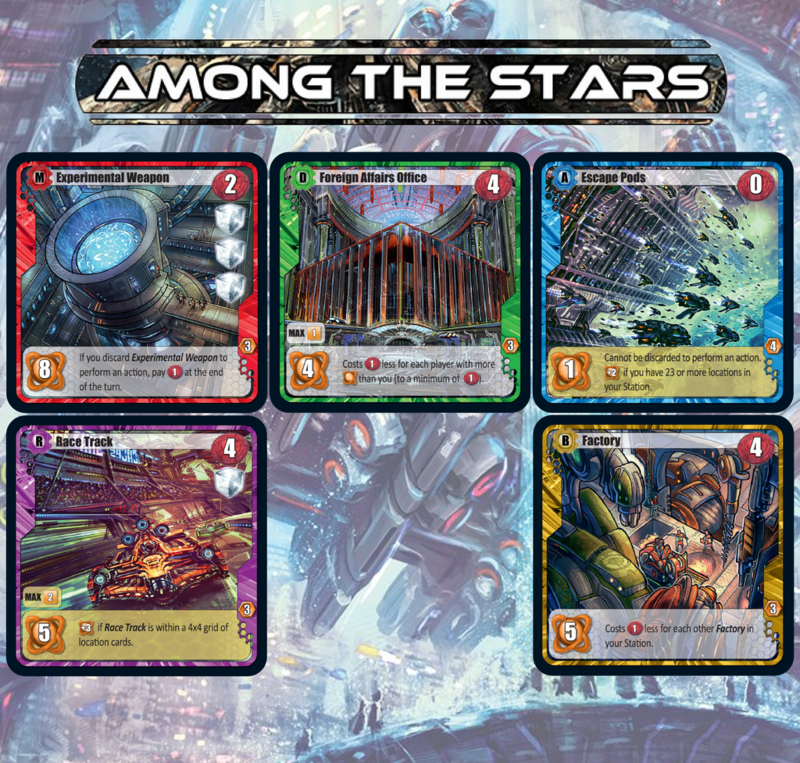 It is a card that forces the players to build their stations in a specific pattern, just to be ready for this card. The stats were good, the card felt right but what would be its name? It was some days before finalizing the names (we needed to have them in order to proceed with the artwork of the cards). It was 1:30 in the morning and I was driving from Thessaloniki to Ioannina. My future wife was sleeping in the co drivers’ seat and I was trying to think of names for the remaining cards. What should be in a grid in a space station? A central computer, a central area, a central safety something? All the ideas were around something central but then, once I reached a big crossroads in the highway, an image of Wipeout (the video game) and a space station came into my mind. I immediately texted Vangelis with the name (yes, at 1:30 in the night!) and IIRC his answer was “Perfect! Goodnight”. You can never stop thinking about game design. Factory. Business locations are the ones having to do with credits. Business locations offer various ways to provide credits, most of the times by lowering the cost of the location you build. Such cards were also present in the original basic set. However, the Factory location forces your opponent’s to re evaluate the card once you build one or two of them. The choices during the draft get harder as more copies of factory enter play. A pretty straightforward card that can only shine as a basic location, since it will be in more copies than two. There are 10 more basic location cards in the new basic set. The whole new basic set offers new strategies and new choices. I believe that you will enjoy it a lot. I don't see a mark on the card that indicates that these are from the expansion. Is that correct? The lack ofsuch an indicator would make sorting them at the end more troublesome. That's when we thought of creating more Basic locations for the game. The approach would be similar to what deckbuilding games usually do: Have a big pool of cards and randomly use a subset of them in every game. Yeah, but a deck building game like Dominion keeps all cards separated. AtS requires one to make on big draw pile. Yeah, but a deck building game like Dominion keeps all cards separated. AtS requires one to make one big draw pile. Separated at the beginning but then they get all mixed in the players' decks. The creation and usage of a new set of basic locations is not going to happen in every game that you play (unless you want to of course). The added variety between the games comes from the special locations that are different in every game. What we have done and what i actually propose to the players to do once they grab the expansion, is take the new basic set as it is, use it as it is and just shuffle to it special locations from both the basic set and the expansion. Once you think that you have played enough of this new basic set, build one from the proposed ones (the proposed set ups can be found here http://boardgamegeek.com/file/download/nk0oxwhor5/ats_the_am...) and play with it. It is better to play consecutive games (not in one day but as you play the game) with the same basic set to get the feeling of the card distribution and the strategies involved. After some time, continue with another of the proposed sets or a set of your own. Yeah, but after the game the cards in the players' decks are easily sorted again. Those decks typically only have a few types of cards. Typically, I want to store Dominion with all the cards separated by title, and clean things up like that, because the game is started with all cards separated by title as well. AtS requires one big deck of all starting tiles and a number of special ones. One wouldn't sort all the cards at the end of a game, only to shuffle everything back at the start of the next. And let's not talk about how the insert in the Dominion case makes it easy to sort every card by title vs the "throw everything in one big box" lack of insert in Ats. Sorry, but I find the comparison still invalid. I think that you overestimate the number of times that most people will play AtS. You have stated on a number of occasions that your group has played the game dozens of times. In that case your approach may be interesting. At our club, the game has only come to the table a couple of times - I think that I played the game maybe six or seven times since I got it last year. I have not gone jaded with the base set yet. I wonder - when you make proposed sets of base cards, shouldn't there also be sets of special cards to zoom in on the sets theme? Or just playability? For instance, if the base set lacks turrets, is there any use in keeping the turret card in the special cards? Just so I'm understanding -- ALL basic cards from the original game are no longer going to be used, and replaced with the Ambassador base cards? No. The expansion adds even more basic location cards and before playing you just pick 15 of them (either from the expansion or the main game) and you play with them. The whole concept behind the basic locations (as opposed to the special ones) is that you know they are in the "pool", you know there are 4 copies of each in, and you plan your strategy around them. Imagine something similar to Dominion where during setup you choose the cards that you will play with and each combination offers different strategies/possibilities. We already have and there are already plans to make one in the near future. Ok, thanks sorry for being dense! sounds great! I don't see a mark on the card that indicates that these are from the expansion. Is that correct? Yes. There is no such mark. We thought about doing this but giving even more such instructions (to cover all such cards) would make the setup take even longer. However, if people are willing to do this before playing they are more than welcome to do so. A good solution for the special Turret for example (if you don't want to see it when the basic location is not included) would be to store it along with the Basic locations of the same name so that whenever you include them, that one is also in the pool. The same goes for other cards that reference Basic locations. I think that Vangellis covered your previous questions. Concerning this one now. I propose to the people what i think it is better for the play experience. If most of the groups play only one game of AtS at the time (in my experience most of the groups play two consecutive games and then play something else), then you can actually use a different set up each time if you like. However, if you play more games in one sitting or if you generally play AtS, i still propose that you play some games in a row with the same setup. Doing this, the playgroup itself starts to evolve strategies and counter strategies based on the plays of this specific group and based on the card mix. I believe that this is a spectacular thing to watch, but then maybe it is me and my love for balanced evolving gaming environments. Well, I really like this idea of a "pool" as well as thematic sets of basic location cards as described here. But now as I have unboxed all the stuff of picked up at Essen (Ambassador and all available promos) I am kind of overwhelmed because I do not like the thought to sort out all basic locations after every game. That seems to be a pain in the neck. This is my solution for storage. I use a big ziplock bag to include all the special locations. ALL of them, basic set, expansion, indiegogo promos, kickstarter promos, proxies for future ideas etc. Since you need to draw special locations at random, the best thing is to have them all mixed. Concerning the basic set, as i have stated before, i like to play sometimes with the same pool and then move on. So i have a basic set ready to play and stored in a separate ziplock bag and all the other cards for the basic set, stored together in another bag. If i want to start a game, i grab the special locations pile, the besic locations pool that i am using at the moment and start the game. If i want to add ambassadors (and you should, they add a lot to the game), i have them stored together, and bring them out as needed. The thing is that if i want to play with another card pool, i prepare it before hand and have it ready, when the game starts. I really think that it is very interesting to play back to back games with the same basic locations card pool. So my "solution" supports this. Thank you for sharing your approach. It sounds good to me and I think I will do it that way as well. I guess the discussion came up because we all are king of pampered by Dominion. It is basically the same (pool of plenty of cards) but the storage system is much better because every card has its own slot so that you can choose the cards right out of the box. So I got AtS: Ambassadors, sleeved and sorted out in to the box I've made, mixed it in with the base set. Now Ive realised I have no idea what the ratio is for sorting out the cards to play with. I have 99 3 player cards, 33 4 player cards and 121 Special loactions. Check the rules of the expansion mate. 3 sets of basic locations for each location type (colour). If you are 3 players you play only with the cards marked with a 3, if you are 4 players then you add also the same cards marked with a 4, 45 cards for 3 players, 60 for 4 players. After that you add randomly 27 special locations for 3 players and 36 for 4 players. I got that bit, the problem I have is if I used the cards for a 4 player game (All 3's and all 4's) that would be 132 cards. How may 3's were in the base game? 18 different x 3 equals 54 3s in the base game and 15 different x 3 equals 45 3s in the expansion. From these you choose 15 different x 3 (or x 4 for a 4 player game) and then you add the specials. My solution (which only works because I didn't sleeve the cards) is to smoosh all 4 copies of each base card into a single 70mm x 70mm sleeve. Then I take all 6 sleeves of one color, randomly pick three of them, and pull out the cards, and do that for all 5 colors. this is a great idea! either that or leave out 1 of each into a separate deck what sleeves did you use?